LF.3.A1.1 | LF.3.A1.1 (En Español) Distinguish between functions and non-functions/relations by inspecting graphs, ordered pairs, mapping diagrams and/or tables of data. 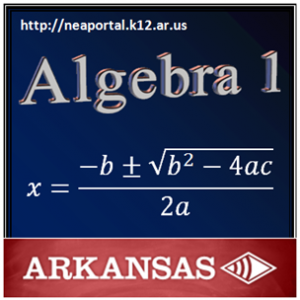 LF.3.A1.2 | LF.3.A1.2 (En Español) Determine domain and range of a relation from an algebraic expression, graphs, set of ordered pairs, or table of data. LF.3.A1.3 | LF.3.A1.3 (En Español) Know and/or use function notation, including evaluating functions for given values in their domain. LF.3.A1.4 | LF.3.A1.4 (En Español) Identify independent variables and dependent variables in various representational modes: words, symbols, and/or graphs. LF.3.A1.5 | LF.3.A1.5 (En Español) Interpret the rate of change/slope and intercepts within the context of everyday life (Ex. telephone charges based on base rate (y-intercept) plus rate per minute (slope)). LF.3.A1.7 | LF.3.A1.7 (En Español) Determine by using slope whether a pair of lines are parallel, perpendicular, or neither. LF.3.A1.9 Describe the effects of parameter changes, slope and/or y-intercept, on graphs of linear functions and vice versa.